Angry e-mails flooded Mark Cuban's inbox after the Dallas Mavericks' last trip to New Jersey. It disgusted Mavs fans to watch Devin Harris dominate the team that made him the centerpiece of a trade package to acquire a point guard a decade older than him, regardless of Jason Kidd's Hall of Fame credentials. The Dallas fan base was split on the blockbuster deal when the Mavs pulled the trigger in February 2008. The deal, which included eight players and also sent a pair of first-round picks to New Jersey, got a collective thumbs-down after the Mavericks made another first-round playoff exit. Harris' 41-point, 13-assist show in the blowout win over the Mavs last December -- the type of night that allowed him to earn his first appearance in the All-Star game -- rubbed salt in open wounds. As the Mavs make their annual stop in New Jersey -- where the Nets will set an NBA record for futility with an 0-18 start unless they pull off the upset Wednesday night -- this seems like a good time to reopen the debate about the boldest personnel move in Mavericks history. So, how often do the anti-Kidd, pro-Harris rants pop up in the inbox these days? "Not in a long time," Cuban said with a smile. "Not in a long time." • Read the rest of MacMahon's story on ESPNDallas.com. 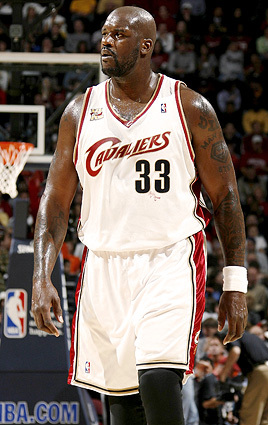 The Big Shaqtus will take on the Suns for the first time since leaving Phoenix this past offseason. • The Suns visit the Cavaliers on Wednesday, coming off Tuesday's 126-99 loss to the Knicks at Madison Square Garden. That game snapped Phoenix's streak of 20 straight regular-season games of scoring at least 100 points dating back to April, which was the longest active streak in the NBA. Phoenix was the first team in 18 years to score at least 100 points in each of its first 17 or more games of a season. The last teams to do so were the Bulls (19) and Warriors (18) in 1991. • Two of the Suns' four losses this season have come in the second game of a back-to-back, with both also coming on the road. Cleveland swept the season series with Phoenix last season for the first time since 1997-98, and LeBron James was a big reason why. The King averages more points against the Suns than against any other opponent in the NBA.